Background/Info: American formation Die Sektor saw the daylight in 2004. The debut album “To Be Fed Upon” released on the now defunct, but still legendary NoiTekk in 2006 became an instant success. This album now gets a new re-release featuring next to the original 11 songs from the album 3 bonus tracks. The first 100 copies are featuring an extra disc. There you’ll (re)discover the first self-released EP of the band (cf. “Scraping The Flesh”) plus 8 early demo songs. Content: “To Be Fed Upon” remains a powerful dark-electro work. Solid bass lines, haunting atmospheres, heavy electro-industrial kicks and distorted vocals made the splendor of this album. Somewhat inspired by Suicide Commando and revealing an elaborated writing, this album was an astonishing debut for Die Sektor. The original versions haven’t lost their initial power and magic. The album ends with three bonus songs. The second disc brings us back to the early years of Die Sektor. Next to the songs featured at “Scraping The Flesh” you’ll get the opportunity to hear old demo songs. Most of these songs remain instrumentals. 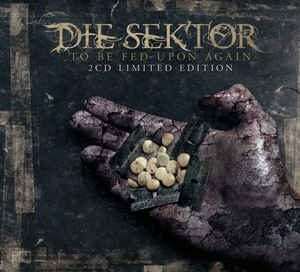 + + + : Die Sektor got an instant recognition because they revealed an impressive, mature sound. They deal with dark-electronics, sometimes reminding to Suicide Commando, but with this extra industrial –and I dare to say American touch, they later on would elaborate. “To Be Fed Upon” also sound tormented and that’s also a part of the band’s success. This is an opportunity to rediscover songs as “Painkiller”, “Motionless”, “Electronic Savior”, “Lustangel” ao. This re-edition also is an interesting work for the fans as you’ll get multiple bonus songs (which were already released on digital format), but the CD has a booklet as little extra. It’s pretty cool to (re)discover the 5 songs from the EP “Scraping The Flesh” (2004). – – – : The bonus songs make the interest of this re-edition although the featured songs don’t really sound as the most inspired and accomplished compositions in the band’s discography. Conclusion: The original album “To Be Fed Upon” still sounds great and doesn’t suffer at any moment from the weight of time. It’s an opportunity to rediscover how it all started for Die Sektor while they also give you a view upon their very early demo work. Best songs: “Painkiller”, “Motionless”, “Electronic Savior”, “Lustangel”, “Deathkill”, “Prey To The Razor”.